A hidden cypher and an English traitor... pull the jaded couple together in a desperate search. Charles, The Duke of Eversley has paid several visits to Miss Georgette Quinby, also known as the Mad Heiress. The Duke’s sister is incensed. Georgette has been beset by scandal due to an incident nearly a decade ago when her former fiancé jilted her, and married another. It is rumored Miss Quinby threw herself down the stair in a fit of passion. She is certainly not fit company for a duke. Now the Ton is awhirl with gossip speculating if The Duke of Eversley could possibly be courting The Mad Heiress, but Georgette knows the truth. She is not his love. 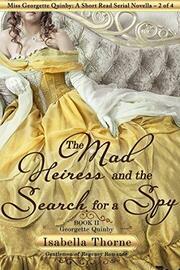 Miss Quinby has been helping The Duke to catch a spy working against their beloved England. Eversley enlists Georgette’s help in an illegal, but exciting rouse to occupy the possible traitor so that The Duke may search his lodgings for evidence. It is all very improper and if the Ton should find out….well, Georgette can only hope they do not … At least, not until she and The Duke can catch the spy. From the ballrooms of the English Aristocracy, to ices at Vauxhall, to gambling halls, and secret meetings at the British Museum, they will dare much for King and Country. Both have sworn they will never love again…but together they will find that even the most broken of hearts can heal.